The reason is simply that they are able to retain vastly more heat than the atmosphere. “We find that the heat uptake of the global oceans has doubled since about 1997, compared to what took place prior to that over the industrial era. And that was a surprising result to us,” he added. We tend to think of global warming as an overall upward trend in air temperature — but that’s simply the most immediate way in which we experience it. ““We find that the heat uptake of the global oceans has doubled since about 1997, compared to what took place prior to that over the industrial era. What scientists discovered in 2014 is that since the turn of the century, oceans have been absorbing more of global warming’s heat and energy than would normally be expected, helping to slow rates of warming on land. What they will be talking about in 2015, and beyond, is when that trend might come to an end—likely following a routine shift in Pacific Ocean trade winds. So the question remains: If the deep oceans aren’t warming, where is all that extra heat going? We … don’t really know, at least not yet. But it’s definitely going somewhere. 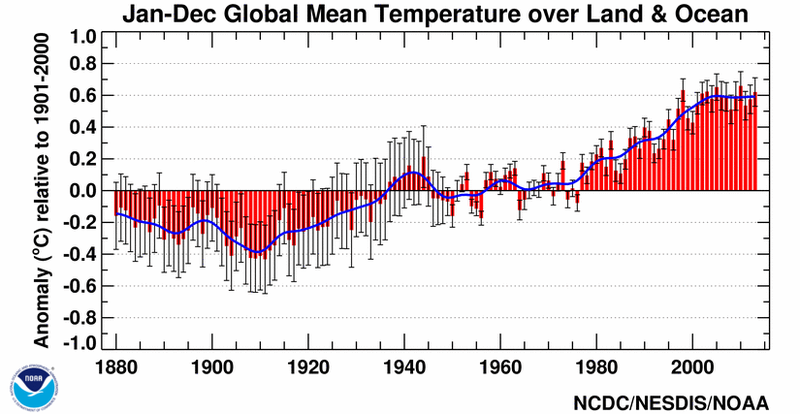 Regardless, all global combined LSAT and SST data sets exhibit a statistically non-significant warming trend over 1998–2012 (0.042°C ± 0.093°C per decade (HadCRUT4); 0.037°C ± 0.085°C per decade (NCDC MLOST); 0.069°C ± 0.082°C per decade (GISS)). “The slowdown in warming is probably a combination of several different factors,” says Mann. Scientists have noticed that while greenhouse gases have continued to mount in the first part of the 21st century, global average surface air temperatures have stopped rising along with them, said Nasa. But latest data from satellite and direct ocean temperature measurements from 2005 to 2013 “found the ocean abyss below 1 995m has not warmed measurably,” Nasa said in a statement.